BRIGGS 291375 GASKET SET, FITS MODELS Z & ZZ. 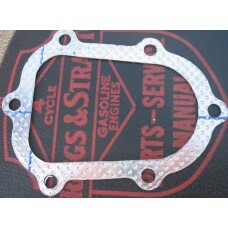 This is a gasket set made up from OEM and reproduction gaskets. It fits the Briggs models Z &..
BRIGGS 291617 COIL / ARMATURE. This is a Briggs 291617 coil / armature. It fits most 1 to 3 HP single cylinder engines that have a ..
BRIGGS 293477 FLOAT FOR NEWER 4 BOLT FLOW-JET CARBURETOR. This float is used on the later 4 bolt flow jet carburetors. The part that contacts the float is sho..
BRIGGS 294836 ARMATURE/COIL, 8 THROUGH 16 HP. This is a Briggs 294836 armature/coil. It mounts with 4 screws and is used on 8 through 16 HP single..
BRIGGS 390306 .020 UNDERSIZE CONNECTING ROD, 13, 15 and 16 HP. This is a 390306 Briggs .020 undersize connecting rod for models 300000 and 320000 series engines. T..
For sale is a Briggs OEM 66403 flywheel key. It fits models A,B,K,L,M,Q,R,S,T,W and Z. All parts ar.. These head gaskets fit Briggs models A,H, L, M, S, T and Y. They are high quality reproductions. The..
BRIGGS 99200 PISTON ASSEMBLY .020 FOR MODELS B & 14. For sale is a Briggs 99200 piston assy. It is a .020 oversize and includes rings and circlips. It fi..
BRIGGS 99622 FLOAT, EARLY SMALL 4 BOLT FLO-JET CARBURETOR. This is a Briggs 99622 float that fits the early 4 bolt flow jet that was used on models A, N, 5, 6 ..